In the depths of space, Lee McBain, a high ranking official for the nation planet of Gladius, is returning home in his spacecraft after a rather successful trip in which he completed several treaties with neighbouring planets. After recording a verbal report, the ship’s crew notice what seems to be a group of spacecraft tailing them on their radar. However they cannot make a visual sighting of their pursuers. Soon they notice that stars are vanishing and realise that a strange type of gas is surrounding the ship. But escape is impossible, no matter how they try. The crew spot a scaled creature in the gas just as the ship crushed and destroyed. Meanwhile in orbit around Gladius, three cadet pilots in the space force, Eddy, Dan and Lee McBain’s daughter, Stephanie, are investigating a wrecked space craft which has drifted into Gladius' orbit. Inside the trio discover a cryogenic chamber filled with dead alien bodies. Much to their surprise they discover a beautiful woman, unlike the other aliens is human in appearance, still alive in a frozen cryogenic state. A holographic message embedded in the cryogenic machine tells them that her name is Paola and she is from the fifth planet of the Sonar system. The message also has a further, darker warning; Paola's planet was attacked by an invading force called the Bacterian. First the stars were blocked out by a thick gas and it eventually reached the planet's surface, where it turned everything inorganic on the planet into a massive horrifying organic creature. The surviving inhabitants escaped, but where pursued ruthlessly by Bacterian fighters. Paola was the only survivor. The Gladius government are deeply worried by this message and debate if Paola’s message is true. Not completely convinced of the threat, Eddy, Dan and Stephanie are assigned the task of observing Paola, who only seems to meditate. Dan is immediately suspicious of her and wonders why is she so calm after the home planet has been destroyed. However Eddy believes her and is upset with Dan's scepticism. Stephanie's only concern is that her father hasn't been found after the space craft he was travelling back to Gladius on disappeared. Eventually the stars cannot be seen from Gladius' surface as a thick black gas surrounds the planet. It is evident that Paola was telling the truth. Eddy asks Paola if she can tell with her telepathy where the Bacterian base is. She tells them that it is near the seventh planet of their solar system. The trio advise their superior officers and are given permission to investigate. But as they near the planet, a voice tells Stephanie not to approach, which she brushes off as her imagination playing tricks on her. They are shocked to discover the planet has turned into a gigantic organic creature that spits out weird monster-like creatures that attack the group's fighters. Through the gas they spot the Bacterian's main carrier and thousands upon thousands of fighters. The alien fighters begin their attack, with Eddy firing back at them. But soon the sheer numbers overwhelm the trio. Luckily the voice in Stephanie's head helps them dodge them and escape. Stephanie soon recognises the voice; it is her father's. Upon their return Eddy is severely reprimanded by their commanding officer for firing on the enemy, something they were instructed not do, they were to observe only. Despite the fact he has discovered the weakness of the enemy fighters and in spite of Dan and Stephanie's protests, Eddy is demoted to Ground Division. He ends up being assigned to watching over Paola again. She tells him that Gladius has an ancient device that can control the Bacterians. She believes she can find it via her telepathy, and both set off in a fighter to track the object down. Meanwhile the Gladius Attack Force heads for a confrontation with the Bacterian base. Stephanie's father contacts her again via ESP and tells them that they are headed for a decoy and real base is elsewhere. He explains to her that he is in the Fortress “Zero”, and gives her the co-ordinates. Dan follows her when she breaks unexpectedly from the attack force. Both of them enter the fortress and in the centre of it Stephanie is shocked to discover the truth. Back on Gladius, Paola and Eddy have discovered the “controller”. It is an ancient obelisk, seen nothing more as tourist attraction by the locals. When Paola tries to get near it, it rises out of the ground and attacks her. Eddy decides to destroy it to stop it from killing Paola. When the dust settles, Eddy realises he has made the biggest mistake of his life. 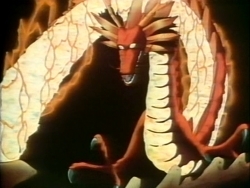 This three part OVA is mostly based off a mid-1980's arcade video game called “Salamander” (released as "Life Force" in the USA and Europe in home console versions) was released, produced and funded by the game's maker, Konami. As with the many anime adaptations based on video games, unfortunately this adaptation suffers due to its original source material, especially with mecha and the Bacterian design. But the staff of the series have given their best shot at making something decent out of these limitations. 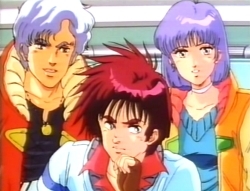 You might have already guessed from the pictures that Haruhiko Mikimoto (“Macross”, “Gunbuster”, “Gundam 0080”) provides the character designs. Director, the late Hisayuki Toriumi (“Gatchaman”, “Like the Clouds, Like the Wind”, “Area 88”), did a great job with the material and for the most part keeps the story moving along at a good pace without it turning into one battle after another. In fact the focus here is on the characters and the battles are rarely touched upon. That's quite a feat considering it's based upon a scrolling shooter game. Using the rather limited graphics from the game, the staff also create a truly creepy Bacterian race, with grotesque planets with pulsating organs and other surreal and bizarre imagery including strange alien fighters and giant golden screaming skulls. But what suffers most in the series is the mecha design and the contradictory nature of the Bacterian. The invaders are supposedly organic in nature. Generally they take the form of Salamanders and turn planets into heaving great hulks of organic flesh. The metallic fighters and their base seem really out of place. Why would the Bacterian need to have inorganic machines to do battle for them? It's also obvious that a lot of the designs such as the fighters and ships, have been incorporated fairly faithfully into the anime. This however makes the designs look incredibly dated when compared to other mecha design in anime of that period. As with the staff, the cast include some well-known names who give good performances; Kazuhiko Inoue (Ninzaburo Shiratori in “Detective Conan”, Kakashi Hatake in “Naruto”), plays Eddy Evans, Kouji Tsujitani voices Dan (Yakumo Fujii in “3x3 Eyes”, Justy Ueki Tylor in “Irresponsible Captain Tylor”), Noriko Hidaka as Stephanie McBain (Noriko Takaya in “Gunbuster”, Shiny Chariot in “Little Witch Academia”, Akane Tendo in “Ranma ½”), the late Hirotaka Suzuoki was cast as Lord British (Bright Noa in the “Gundam” series, Dragon Shiryu in “Saint Seiya”) and finally Sumi Shimamoto as Paola (Ginrei in “Giant Robo”, Nausicaä in “Nausicaä of the Valley of Wind”). While the first OVA deals with the invasion of Gladius, the two remaining episodes take a different tact and are quite interesting. 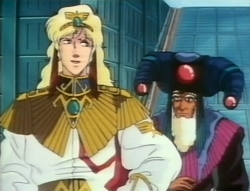 The second episode (based on the game’s predecessor, “Gradius”) involves the planet Lotus. It's ruler, the young and dashing Lord British calls on Dan, Eddy and Stephanie to help them fight the Bacterian when their obelisk that protects them is accidentally broken. Along the way we discover dark secrets in Eddy's past and Lord British decides that Stephanie would make a good queen. 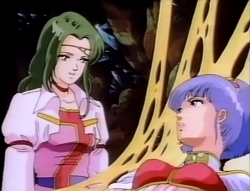 The third episode (based upon the “Gradius II” game) has Stephanie being kidnapped by the Bacterian for the purpose of having her brain melded into a super Bacterian creature named Gopher. Lord British and Dan set off to save her. The better parts “Salamander” are when it ignores games it was based on and the staff creates new stories and scenarios. The second OVA is the best of the lot and adds a lot of depth to the characters. As per usual Western Connection's adaptation and handling of the product is very poor. The subtitles on these three tapes are pretty appalling for a commercial product. Jonathan Clements's translation is good, but the subtitle timing is woefully off, even more so than their other releases, and there's also typos galore during all three tapes. Watching the tapes is a pretty painful experience due to these subtitles. While I can generally figure out who said what, it just makes for a completely frustrating viewing experience as the subtitles appear so randomly that you don't know when they'll appear next. This anticipation really lessens any enjoyment the viewer gets out of the show. The packaging of the tapes have a few problems too. The cover of the second tape is an extremely crappy photoshopped (like a very early version of Photoshop) one that they've put together themselves out of random screenshots from the series. It's shoddily done and quite ugly. The synopses on the back of the second and third tapes are surprisingly their own, are intelligible (for a change) and actually resemble what's on the tape, but the first tape's synopsis is clearly culled from Helen McCarthy's review of the series in Anime UK magazine (something Western Connection did consistently for it's releases), which mentions parts of the plot for the second tape. As a bonus, Western Connection have included the advert for one of the early “Salamander” console games at the end of the third volume. However I suspect this was just laziness on the part of Western Connection and was on the end of the original master tape they received. Overall “Salamander” ends up being an average series despite the staff's best efforts. It works best when it ignores its origins and branches off into new stories. The staff has tried their best using the source material, but in the end it has really hampered them. Still, I quite liked this series, although it went on for too long in places. As you can imagine, trying to track down copies of a series released over 23 years ago in the UK on VHS is pretty difficult, but not impossible. Amazingly you can still find copies of Western Connection's VHS tapes, but only the first volume. I found two copies for sale on Amazon.co.uk for around £13 each and one copy on eBay for £8. I only managed to pick up the final part of the series more than decade ago after I accidentally came across a webpage where a European fan was selling off his old anime VHS collection. 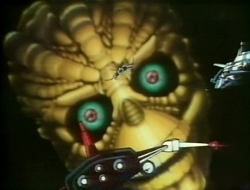 The series was only ever initially issued on VHS and laserdisc in Japan. It never made the leap to DVD, let alone Blu-ray. I would only recommend the series to those who like the original games, or are big fans of 1980's anime. It's fun, but not something that you'll regret not ever seeing.